Dr. Berhanu was born and raised in Denver, Colorado. She attended Stanford University where she earned a B.A. degree in human biology. She earned her medical degree from the University of Illinois School of Medicine and completed her residency in internal medicine at Loyola University in Chicago. She completed her fellowship in rheumatology at New York University’s Langone Medical Center where she served as chief fellow in her final year. Following her fellowship, Dr. Berhanu joined the medical faculty at George Washington University as Assistant Professor of Rheumatology where she had an active clinical practice and trained new physicians. 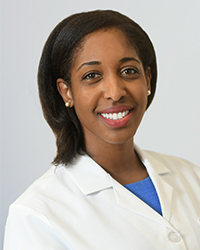 Dr. Berhanu has a clinical interest in musculoskeletal ultrasound for which she received specialized training from USSONAR and obtained RhMSUS certification from the American College of Rheumatology. She applies her expertise with musculoskeletal ultrasound to her clinical interest in gout and has authored or co-authored several articles on the therapeutic management of gout. In addition to her research interests, Dr. Berhanu has long been dedicated to community service, both locally and abroad. She is serving as the 2018 Arthritis Foundation “Walk to Cure Arthritis” Medical Honoree and is particularly proud to have worked with the rheumatology program at the teaching hospital in Addis Ababa, Ethiopia. Dr. Berhanu is board certified in rheumatology and internal medicine and is a Fellow of the American College of Rheumatology. Besides gout, her areas of clinical interest include rheumatoid arthritis, systemic lupus erythematosus, inflammatory eye disease, Sjogren’s syndrome, and osteoarthritis. In addition to English, she is fluent in Amharic (Ethiopian dialect) and proficient in Spanish.